Fuller Library is excited to have our DeStress for Success event again during finals week! Check out our schedule below – more will be added soon! Be sure to also check our SES’s Cram Jam on Thursday, March 15th from 4p-6p! Free Chik-fil-a, while supplies last! Need to stretch and see the sights? 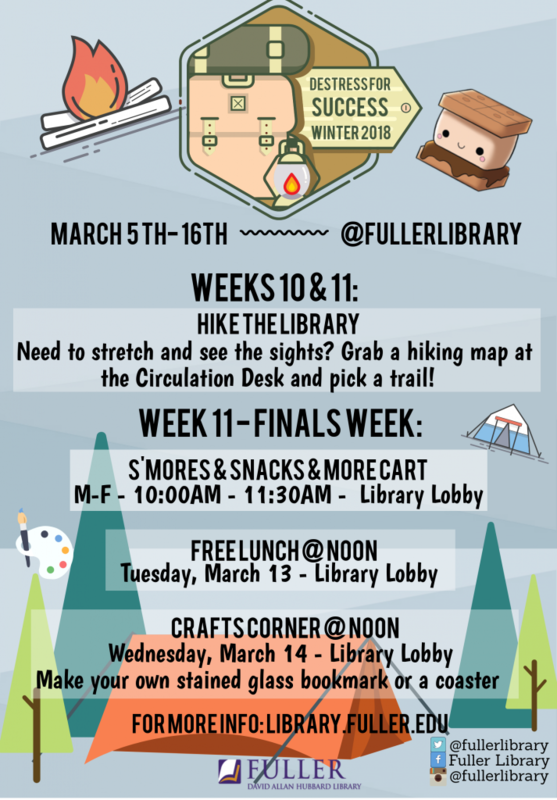 Grab a hiking map at the Circulation Desk and pick a trail! These tickets will be a part of an Opportunity Drawing by the Library and SES for a Survival Kit! Winners will be announced on Friday, March 16th! Stop by the library lobby and make your own “stain glass” bookmark or a coaster!